If you search your ancestors in Nicosia, Sicilia, info about your Italian family are stored in the City Office archives or at the parishes. In towns and villages of Sicilia and in Enna province registry offices were established around 1820: it means that you could find information in Nicosia registrar as of that date. So, if your ancestors were in Nicosia in the nineteenth or twentieth century, then you could try to contact the City Office of Nicosia to know more. Before to start your genealogy research in Nicosia, we suggest you to read our tips for your search . They are useful to search in sicilia and in Nicosia too. 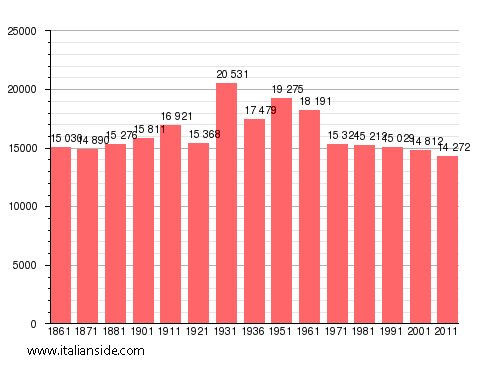 Next picture shows the demographic trends in Nicosia from the Italian Unification (1861) an important info to understand how many people lived there in the past. It could be important to know if the last name you are investigating is a frequent surname in Nicosia. As more your surname is common in Nicosia, as more it could be difficult to find the right info about your ancestors in Nicosia archives if you have not exact dates. Arena, Barbagallo, Barbera, Bonanno, Bruno, Calabrese, Calcagno, Calì, Cammarata, Campagna, Campione, Castrogiovanni, Catalano, Catania, Costa, D’Amico, Di Dio, Di Marco, Faraci, Fiorenza, Gagliano, Giunta, La Porta, Lo Presti, Lombardo, Mancuso, Marino, Marotta, Mazzola, Messina, Milazzo, Muratore, Parisi, Piazza, Rizzo, Romano, Russo, Salamone, Salvaggio, Sanfilippo, Santoro, Savoca, Schillaci, Siciliano, Timpanaro, Trovato, Valenti, Vitale. Church archives in Enna province may instead contain even older information, but they are far less accessible from abroad (and almost impossible by email). If you have the opportunity to visit Nicosia and Enna province, you could plan to investigate churches’ archives by yourself (or with us! ), but from abroad is very difficult to obtain any result unless you find a reliable local help. If you have the opportunity to visit Nicosia and Enna province, you could plan to investigate churches’ archives by yourself, but from abroad is very difficult to obtain any result unless you find a reliable local help. If your research is in a dead end and you need professional help from our local Italian genealogists write to nicosia@italianside.com our expert in Nicosia area will study your request and will reply to you with a research plan and a quote. My Grandfather was Sigismundo DiGrazia. He was born in Nicosia late 1800’s. He came here when he was 17. As far as I know he only had one sister. I do have a letter I believe she wrote. I can not find any information past him. I would like to know her name and his parents. I believe they owned land , as when my Grandpa passed in 1957 all his children and my Grandmother signed it over to the Sister? Just not sure. Would really like to know there names! Trying to find the father’s name of Francesco D’Alessandro born 21 Mar 1915 in Nicosia. His mother was Filippa Billone born about 1888-1890. His father died young. I imagine they were married about 1913. My grandfather was born in Nicocia and was brought to America when he was about 18 I think..His name was Salvatore Caruso. The nicest guy you ever want to meet..He had red hair and blue Eyes ..My grandmother was a Venezia..not sure where her family was from…Good people. Both nonnas emigrated from Nicosia in the late 1800s/early 1900s. One was Maria Testa, the other Felicia Zaccarello or Zaccarelli. Felicia left family behind. My great-grandfather Michael Scilipoti came with his brother Anthony from Nicosia to the United States in 1892 but we don’t know anything about the family older than him. I would love any info about them or their ancestors. Thank you! I will be visiting Nicosia in October. My grandmother was born there. I would love to know if I have any relatives. Her name was Carmella Biondi… she married a Vincenzo Carrera.. Also from Nicosia. I am looking for the Fiscella Family that lived in Nicosia at the bottom of Mt. Etna. They had a winery, but I do not know its name. If you would like to start a research in Nicosia please send your request to nicosia@italianside.com.